Being newlyweds and new parents is challenging enough. 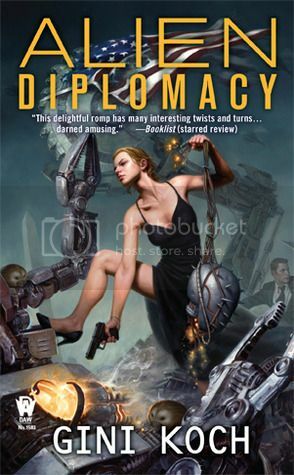 But Jeff and Kitty Martini are also giving up their roles as super-being exterminators and Commanders in Centaurion Division while mastering the political landscape as the new heads of Centaurion's Diplomatic Corps. Enter a shadowy assassination plot and a new set of anti-alien conspirators, and nothing will ever be the same. The book is as crazy as ever. What more can you expect from this series. There are conspiracies, strange taxi drivers, and all while trying to find a nice dress for the President's Ball. The last review I did I made a bit differently and honestly after 5 books it's hard to say something new. I mean Kitty is cool, though I did feel at one time that she should have know better. I mean I knew better and all thanks to my Kitty schooling. But other than that she was on top of things. Martini was actually a bit less jealous than usual, made me a bit sad, I like jealous Martini, cos I am weird like that. Mr White, aww, hihi, I do love him. I fear Christopher's dad is taking spot 2 of my fav Kitty men. Then comes Reader and sadly Christopher is now on spot 4 cos he found a girl. The poofs are adorable as ever, honestly, please get me one! How Koch makes these plots are beyond me. Things are coming at me from every corner, I can't figure out the baddies (well one), or who to trust, and what on earth is going on. And last, there is an excerpt from book 6 at the back and let me tell you, it is pure evil! The way it ends in the middle of something juicy makes me want to get book 6 at once. I think it will be a amazing one. I do recommend this fun series. READ BOOK 1! I kind of love it and do not love it at the same time cos Kitty's neck and arms are so thin, she looks a bit anorexic. Sounds like another madcap book. :) Happy Friday! I don't like the cover for this one. She looks kind of weird but I still want to read this series - it looks really fun. I have the first three. I intend to read this series. I so want to! It really does sound like fun. This does sound like a fun series, I like the name Martini. The lady on the cover reminds me of Angelina Jolie, must be that leg...lol. Sounds great! I feel the same way when writing reviews for books in a series. What I have to say, I've probably said previously and I don't want to give too much away. I just don't think science fiction is my bag of tricks but you never know! this ones not for me but enjoyed your review. Christopher is in my number 3 spot. Did you like Mister Joel Oliver? I liked him a lot in this book. This series is one of my favorites. Yes yes :D I do hope that you start it this summer and that you will enjoy it too! PS the cover is horrid! I agree with you Blodeudd :) I finally got this book last Friday and read it Friday/Saturday. Just posted my own review. Great story, and I never am able to guess the plot. Except that last lady. I did suspect her. But of course not everything that happened. And I do like Martini growing up ;). I never ever read excerpts of the next book if the wait is months. That is tormenting yourself. OOOOO!!! I NEED these books! lol! Especially after reading her Alexander Outland book. Oh, man!